Full Title: Assistant Chief Pilot, MGA School of Aviation. Degree: Bachelor of Science in Business Administration (Flight Management) from what is now Middle Georgia State. "Designed and implemented the Upset Recovery class after training last year at Patty Wagstaff’s Aerobatic School in St. Augustine, Fla. Coordinated with MGA’s own tech services department to design a scheduling program (KnightSky) that replaces the third-party software we currently have. This saves the school thousands per year in operational costs. Cited by President Blake for 'showcasing greatness' to potential students and the public through airshow displays, tours, and operational support of several programs such as Legacy Flight Academy and the annual visit from Morehouse College Trio Program. Creating a basic aerobatics program to improve flight skills and to establish a school presence with the Experimental Aircraft Association (EAA) and the International Aerobatics Club (IAC)." 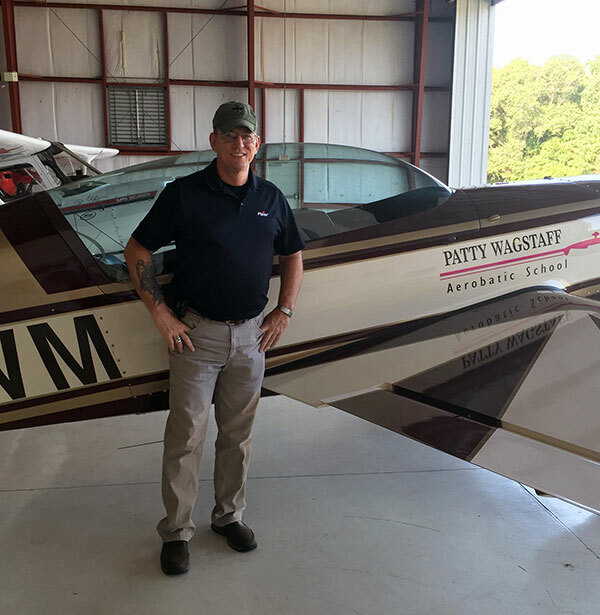 "I originally wanted to fly for the airlines, but I stumbled onto a flight instructor position while attending classes here. I enjoyed teaching so much as well as flying nearly new, very well equipped airplanes, that I changed my mind and became a professional flight instructor instead. Working on the Eastman Campus is the third career I have had in my life, and by far the most enjoyable. I plan on being here a long time." " I have had really great experiences when I learned to fly and throughout my flying career. It’s a great feeling to help others to have those amazing experiences as well. Our students graduate and go off to the airlines or wherever, seeing and doing amazing things in far off places, I think that they will look back someday and remember their time at MGA that was their ‘launch pad’, and the instructors that showed them how to get off the ground." "Maturity and a sense of a pilot’s enormous responsibility. Many people don’t understand exactly how much authority and responsibility rests on the shoulders of a pilot, especially an airline captain. People willingly put their lives in our very hands and they do it with a trust not normally seen in other professions. Hundreds of them depend on us, and they bring their children, too. All of them sit behind you, confident that they will arrive safely, because you know what you are doing and you make good decisions. You have to live up to those expectations, all the time." "I am a volunteer firefighter with both the city of Cochran Emergency Services as well as a captain at the Bleckley County Fire Department’s Station 3. Fighting fires and cutting people out of wrecked cars is what I do in my spare time. Also, I am the proud father of 5 daughters."